I have a daughter who absolutely loves reading, writing, spelling, and every language activity I throw at her. Then I have my two boys. I'll give one some credit, he does enjoy reading. But when it comes to writing, spelling, and every other language activity, the boys DESPISE them! This is no understatement. In fact if anything, the word isn't strong enough. When we first started our homeschooling journey, I tried drilling spelling words into their heads, and giving them spelling tests. COMPLETE FAIL. I stopped and decided to just let them learn naturally. This didn't work either. Dinomite would cry and tantrum for over an hour if he had to write anything, in part because he didn't know how to spell and as a kiddo with ASD he wasn't great at sounding out words. Over the course of our last school year I created some different spelling activities to put on our shelves in hopes that they would learn spelling. They became a weekly thing. Surprisingly, my boys loved them and actually started fighting over them, when my daughter was using them. Dinomite's writing has improved so much! Bulldozer's reading abilities have soared. Princess' abilities astound me. I thought I'd share in hopes that these ideas may help some other struggling mother or teacher out there. This activity comes from my Life At Sea: Week 1 Unit. The kiddos select letters to spell words shown on picture cards. I provided a control card with the words, so Dinomite wouldn't freak out if he couldn't sound a word out. 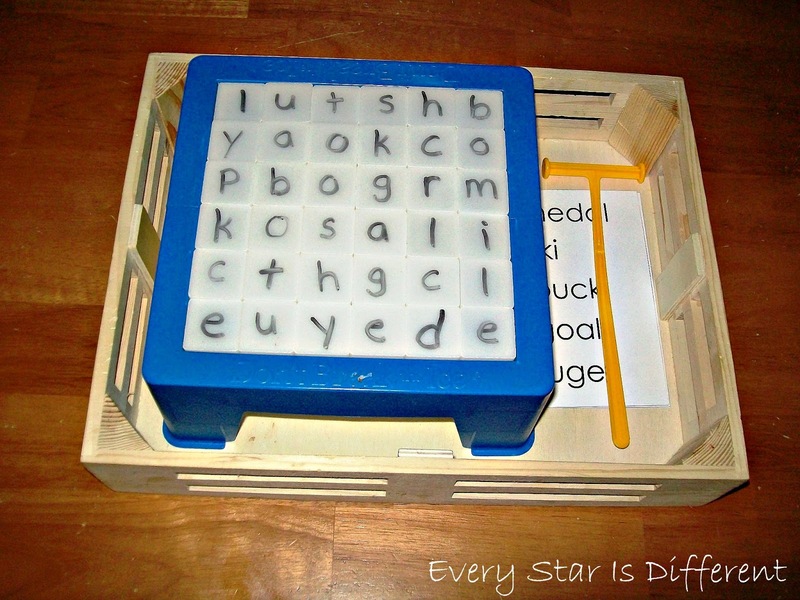 There are many ways to create a Montessori Movable Alphabet. 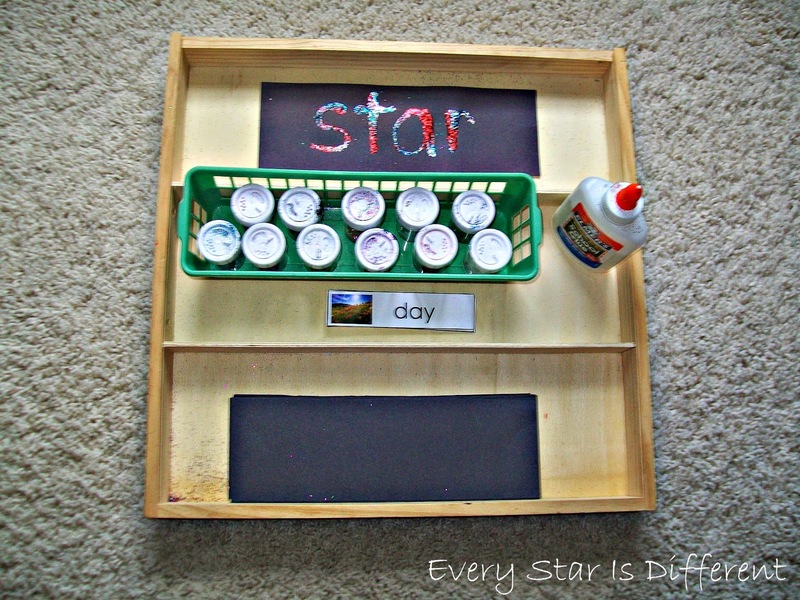 You can use foam, wooden, or magnetic letters. If you have the funds, order a real set. 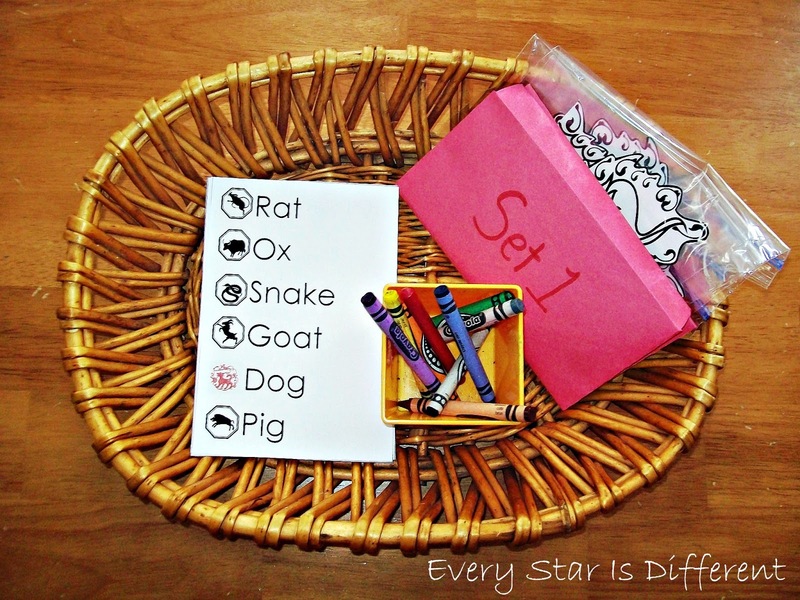 This activity comes from my The Wizard of Oz Unit w/ Free Printables. 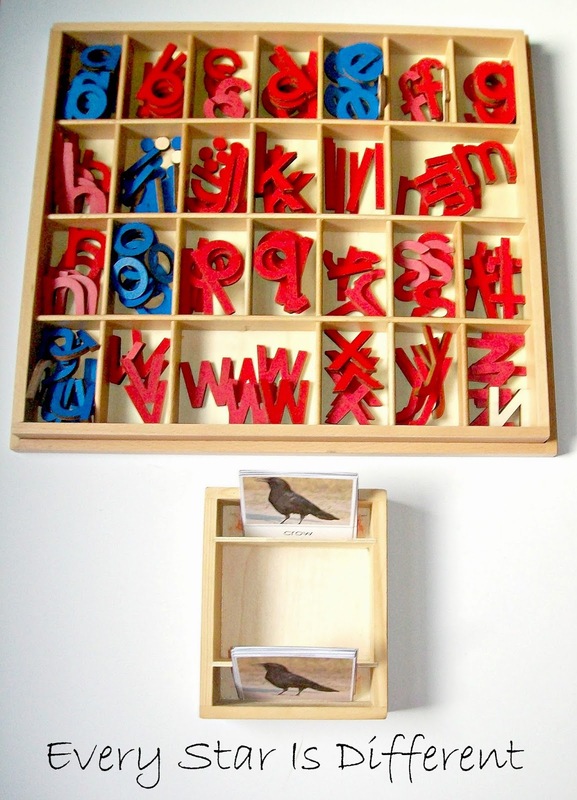 Last month we purchased a real Montessori Movable Alphabet. OH! MY GOODNESS! It was so worth the money! This activity comes from my Christmas Unit: The Nutcracker. Play dough is always a fun way to learn anything. Make it more fun by changing it's color, texture, scent, etc. Bulldozer is a HUGE fan of this spelling activity! This activity came from my Christmas Unit: A Christmas Carol. I found an old Scrabble game at the local thrift store for $2. We've had so much fun with it! All of the kiddos are fabulous at this activity. This activity comes from my Winter Unit. If your kiddos love to get messy, writing in shaving cream is loads of fun. Be aware of any sensitivities to smell your kiddos may have, as the activity can get very smelly. Personally, I enjoy using whipped cream better, but it dissolves much quicker than shaving cream, so you end up using more. This activity is from my Extreme Weather Conditions Week 1: Avalanches, Blizzards, & Ice Storms. Creating spelling words out of anything can be fun. We use sugar cubes here. Marshmallows and so many other things that don't roll around work great. Don't forget LEGO bricks as a possibility. 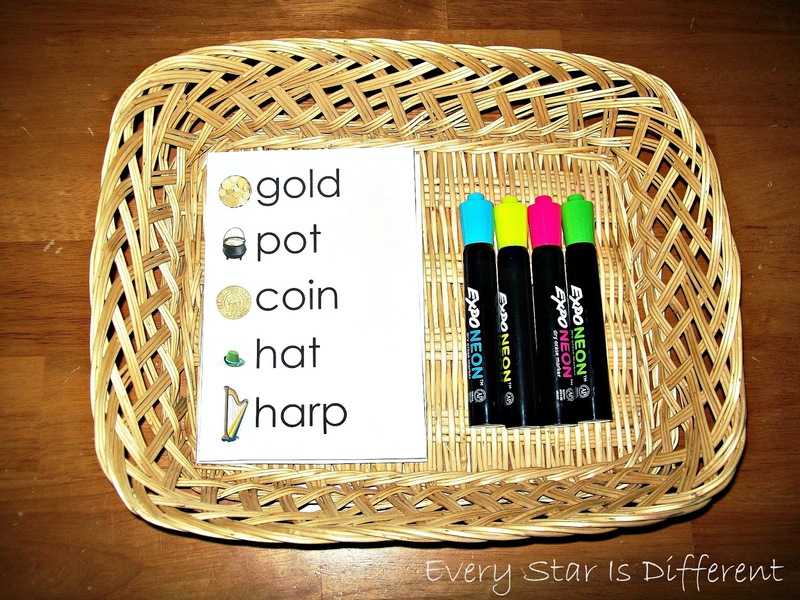 This activity can be difficult for kiddos without a word template, so if you notice your kiddo becoming frustrated, help them, or provide a template for them to lay their items on. 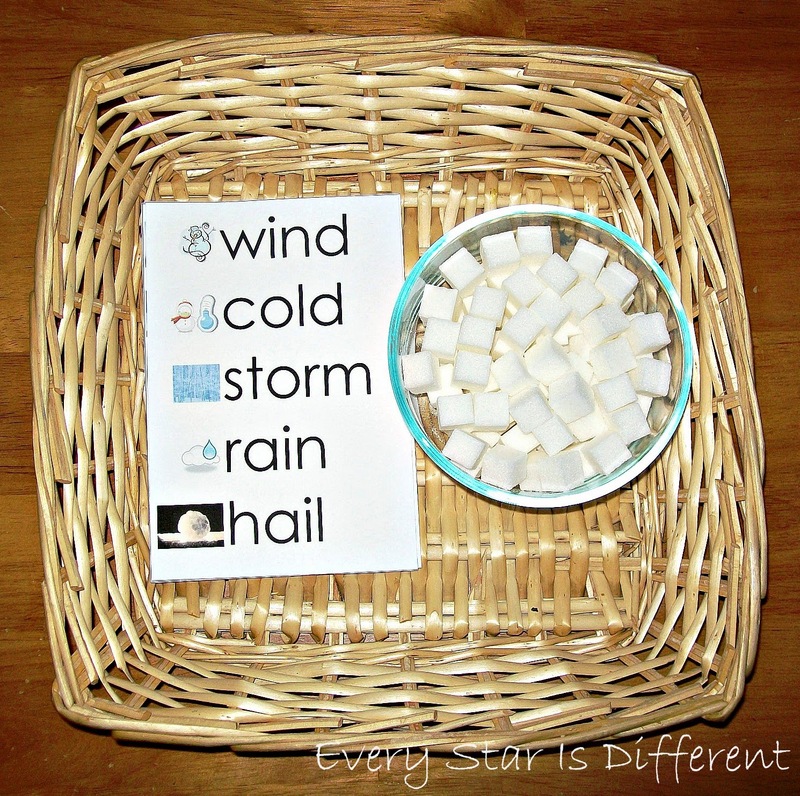 This activity comes from my Extreme Weather Conditions Unit: Hurricanes & Tornadoes. This was by far my favorite spelling activity to create. I just LOVED how it turned out. The kiddos search for letters to spell their words in the sensory bin. Bulldozer had so much fun with this, although I would recommend starting out with a smaller sensory bin, as one this large can be a little overwhelming. This activity comes from my Memorial Day Unit 2. This is another example of a Spelling Word Sensory Bin. I made this one much smaller so the pieces were easier to find. 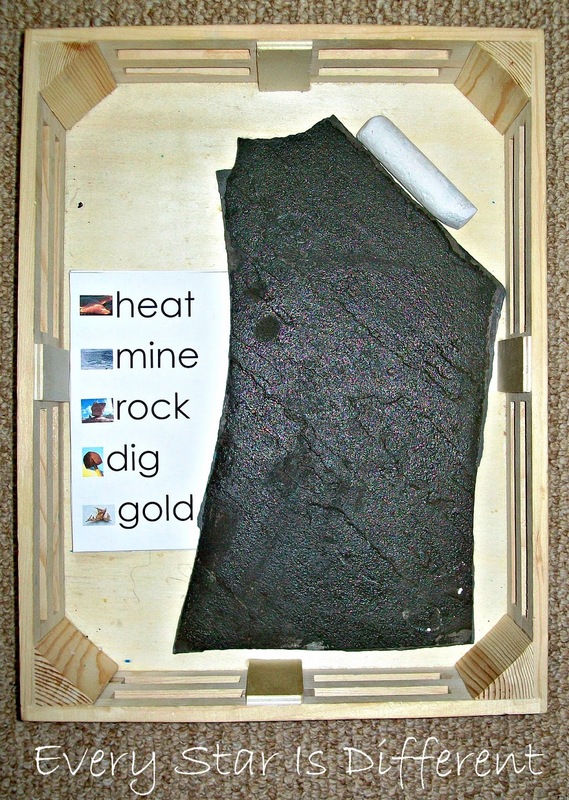 This activity comes from my Chinese New Year & Extreme Weather Unit: Earthquakes & Volcanoes. In this particular activity the kiddos were building dragons as part of their Chinese New Year celebration. They colored a head and tail, and then created spelling words with letters provided to go in between. The dragons turned out absolutely adorable. This activity comes from my 2014 Winter Olympics Unit. My kiddos love the game Break the Ice. 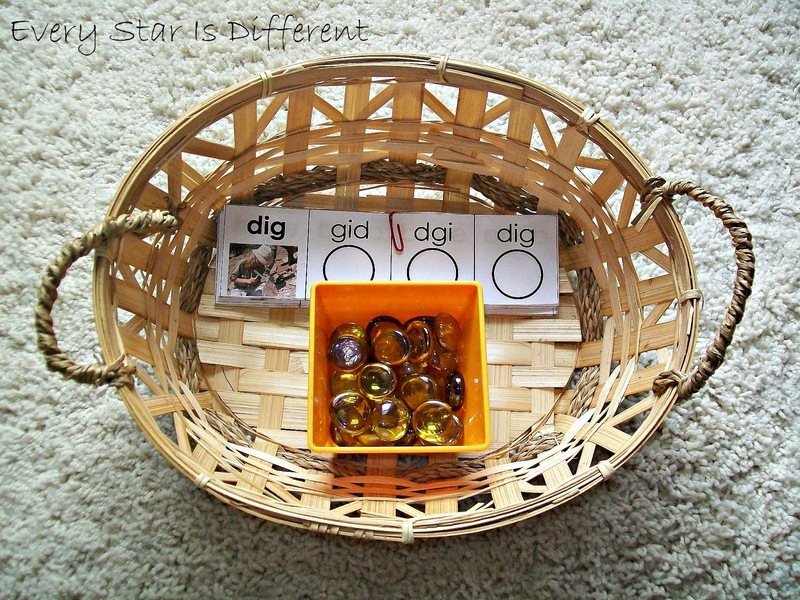 This game is so easy to adapt for fun learning activities. 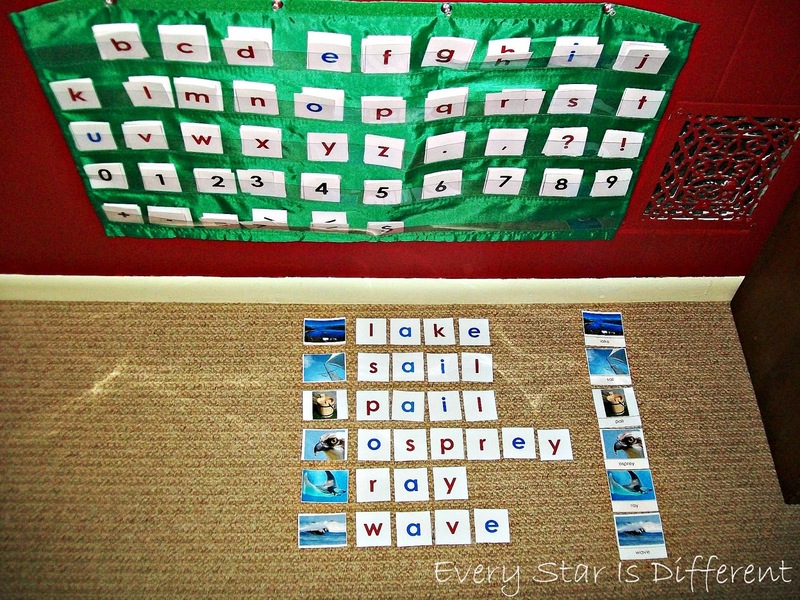 In this instance the kiddos choose a spelling word and tap out the letters. Their goal is to NOT "break the ice." Bulldozer and Dinomite had challenges to see how many words they could poke out before the ice fell. I've seen people put stickers on game pieces before, but erasable markers work fabulous! 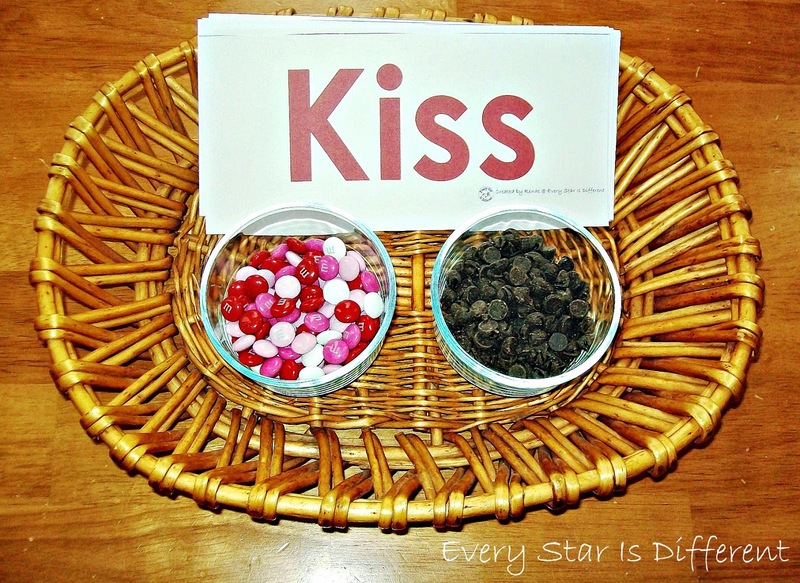 This activity comes from my Valentine's Day in Paris Unit. My kiddos will do anything for treats. All of them thoroughly enjoyed this way of practicing their spelling words. Who wouldn't enjoy making words using candy? The only thing to be careful of here is food allergies. You'll notice allergy friendly chocolate chips in a second bowl for Bulldozer to use. This activity comes from my Black History Month Unit. The kiddos use the dot marker to dot the matching spelling of the word above the picture. All of the kiddos enjoy this, although it is tricky for them sometimes. This activity comes from my Australia Unit. 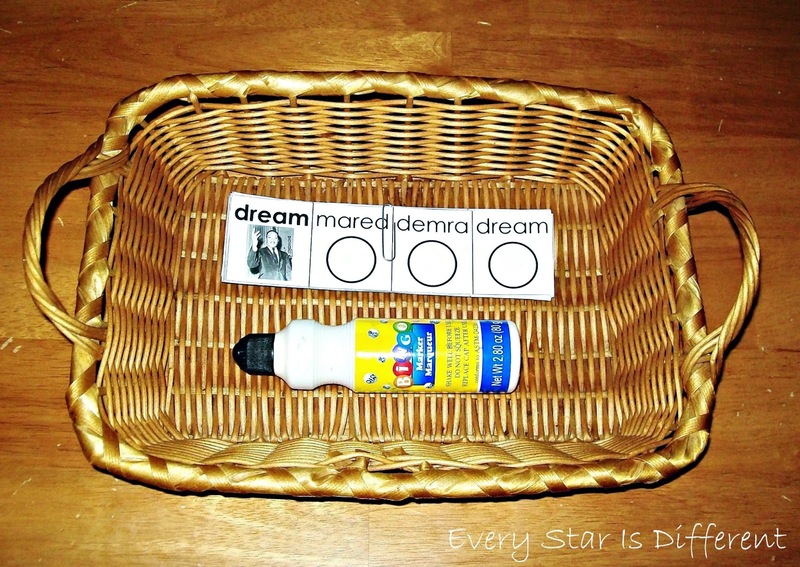 If you or your kiddos don't like dot markers, use a small stamp instead! This activity comes from my Dinosaur Unit. When I don't feel like mess, my kiddos have also used glass beads as markers for this spelling activity. This activity comes from my St. Patrick's Day Unit. My kiddos don't enjoy writing, but if I give them window markers and let them write on the windows, that's another story! They LOVE this! It's a great occupational therapy activity for them too. This activity comes from my In the Kitchen Unit Part 1. 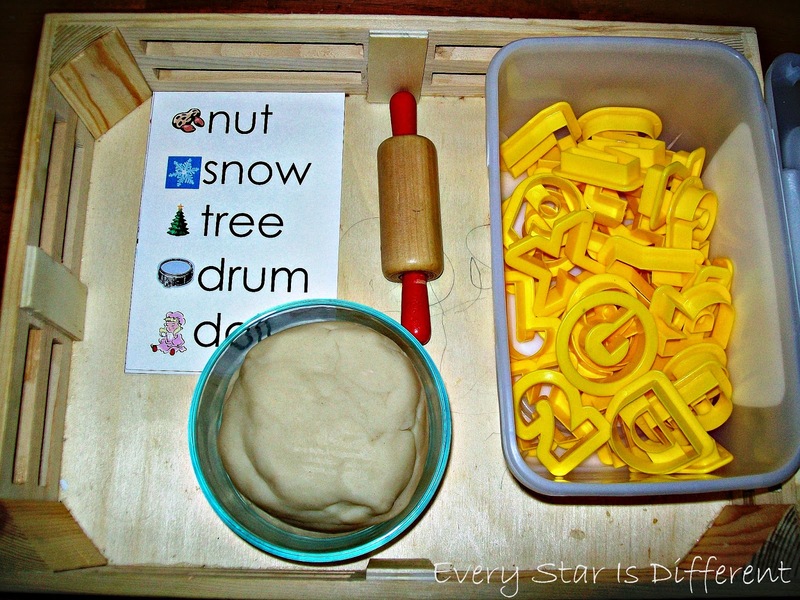 Alphabet crackers, cookies, cereal, or pasta can be used for this activity. No matter what you choose, make sure you have enough on hand so kiddos can treat themselves after each word they spell. The only struggle we have with this activity is meeting the food allergy needs of all the kiddos in our house. Instant pudding is easy to make and comes in lots of scents and flavors. Your kiddos can help you prepare it if you're willing to have them. 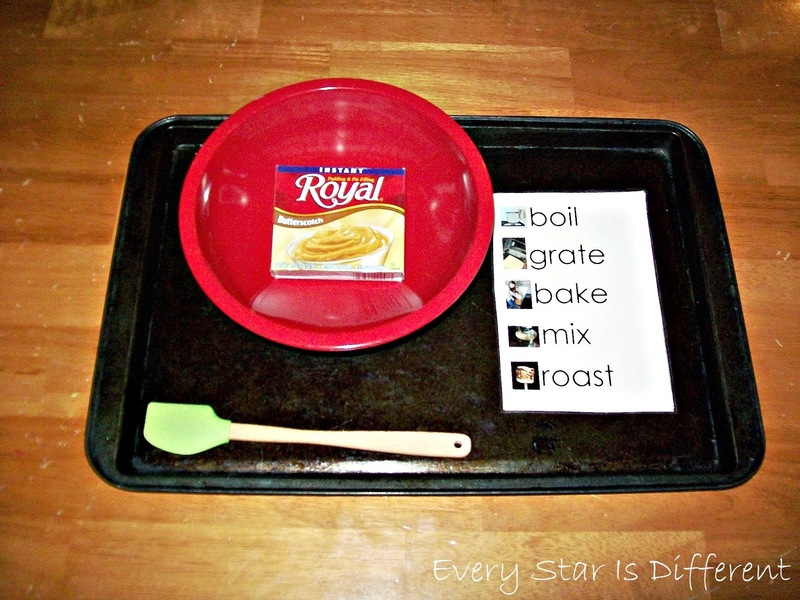 Once it's set, pour some on a cookie sheet and let them practice their spelling. It's always great fun to make activities edible. This activity comes from my Rocks & Minerals Unit. Using chalk is special thing in our house. My allergies do not react well to it. So, when it does show up on our shelves, it's a big deal. This activity comes from my All American Summer Unit: The United States of America. 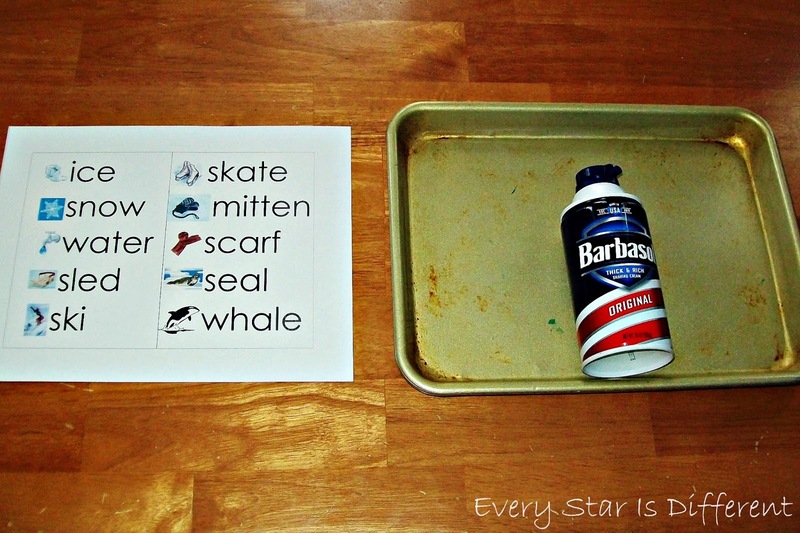 If your kiddo loves glitter and glue, this is a fabulous spelling activity. Write the letters with glue and then pour on the glitter. We used a small bin for emptying glitter, and voila! The kiddos were so proud of their words. This is also a great way to practice handwriting for those who don't like writing! Have kiddos shape pipe cleaners into letters. 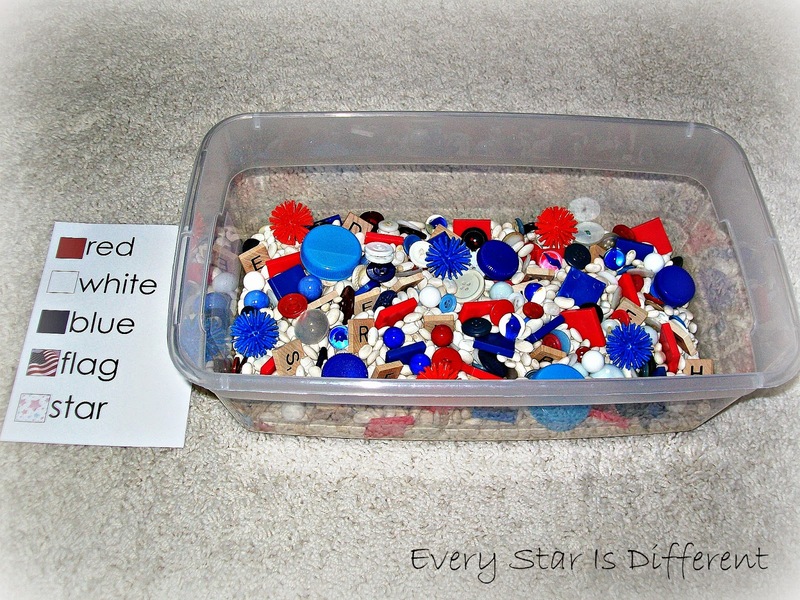 Beware, if you kiddo struggles with fine motor skills, they may struggle with this activity. I've only used it once to create numbers, and my kiddos became too frustrated with it. This is on my list of things to try when I get the chance. The board must be large enough to create the words. 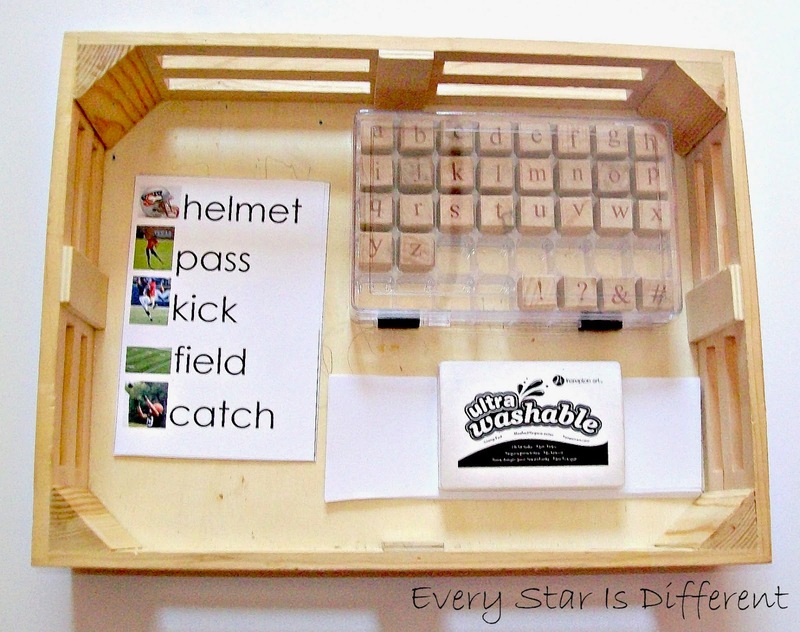 This activity comes from my American Football Unit w/ Free Printables. Whether you use ink, play dough, or something else, the stamps will work great! 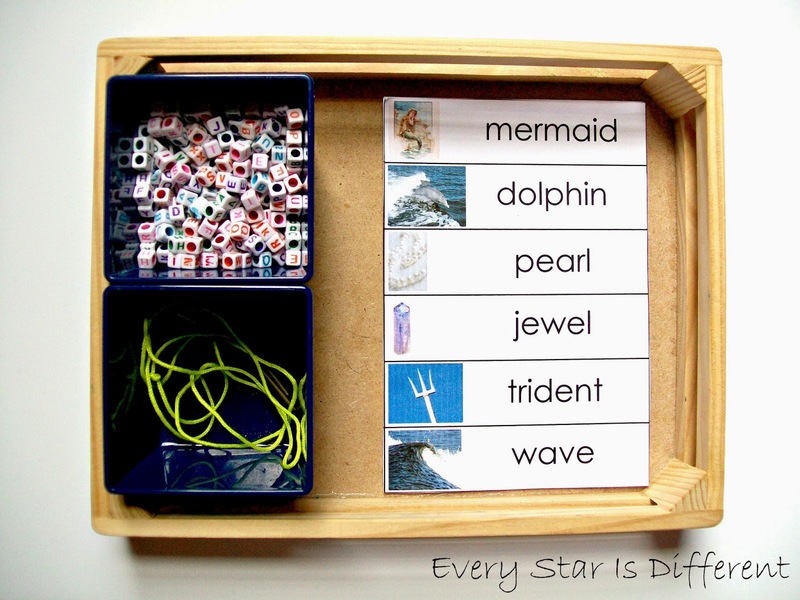 This activity comes from my Mermaid Unit w/ Free Printables. Stringing beads can be so much fun, especially if you're spelling words at the same time. 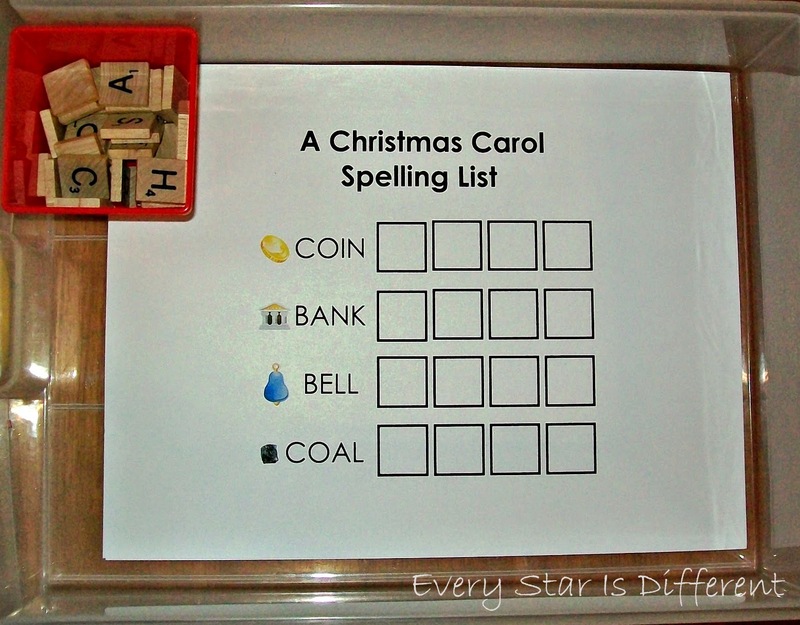 For those that are just learning to spell, you may just want to include the beads needed to make the words on your list. For those who are a little more advanced, just include a handful of beads and let them sort through them. If you have LEGO lovers at your house, anything to do with LEGO will work. If you have duplos with letters, use them. If your kiddo is super creative, have them create their own letters, or use this fabulous template from Wild Flower Ramblings. The sky is the limit with LEGO. 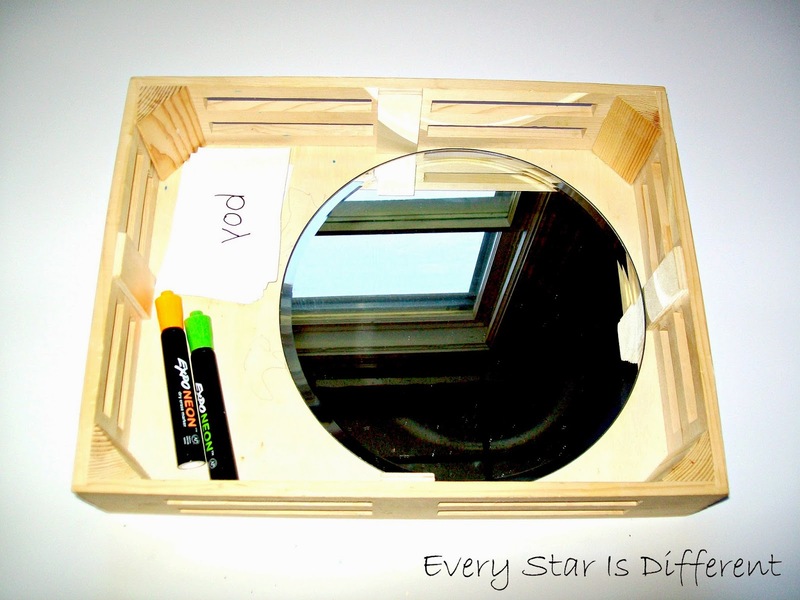 Working with mirrors in the classroom can be so much fun. 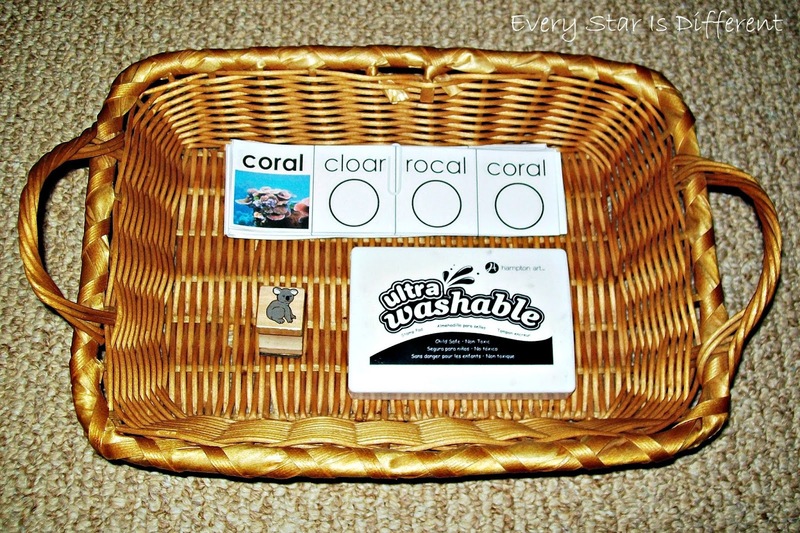 In this activity the kiddos must hold the card up to the mirror, to discover the spelling word on the card. (Words have been spelled backwards so they can't read them without using the mirror. See post for details.) Once they can identify the word, they write it on the mirror using the appropriate markers. 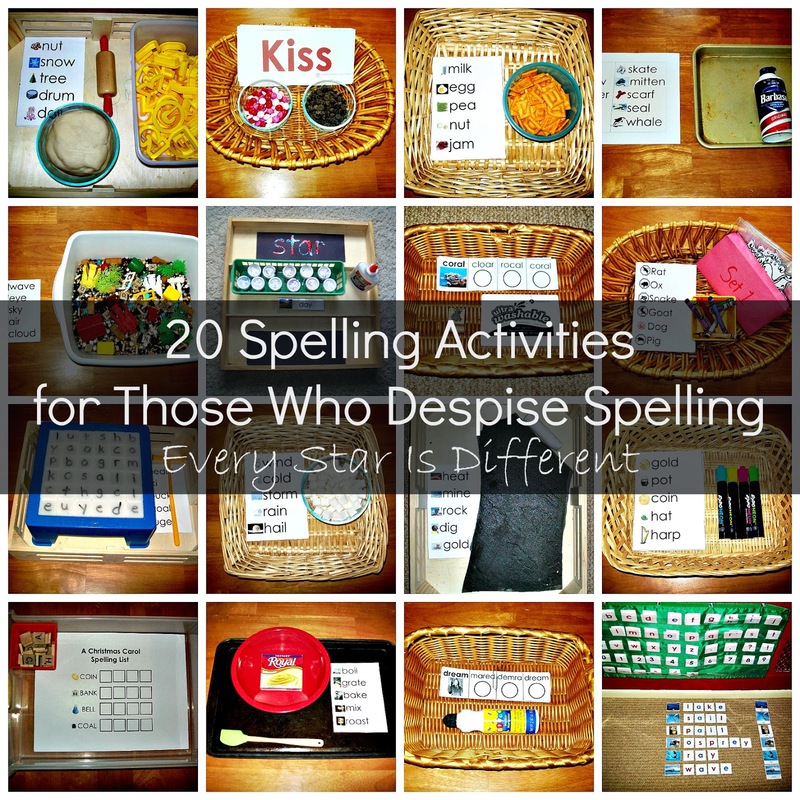 If you have another fabulous spelling activity for those who despise spelling, please share in a comment. 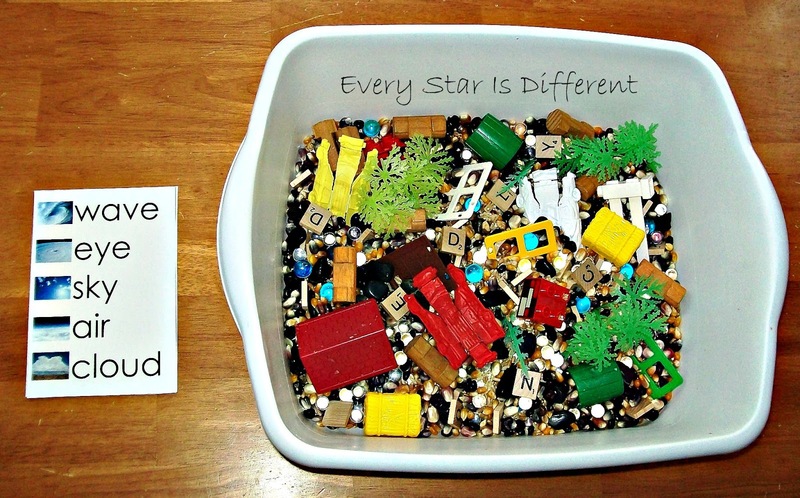 Every kiddo is different so it's always fun to see what others are doing! Thank you!!! Some of these may even engage my super-reluctant learner who struggles with SPD and NVD. Thank you very much Rene for sharing it! I will definetily use some of the ideas with my students that are not very fond of spelling! You are a big help! I'm so glad I could give you some new ideas Katherine. Enjoy your students! Brilliant ideas! We love Scrabble, will try this with the young man. Thank you! Thank you for sharing. My son hates writing too and I think he might actually like some of these activities. Try the Word Wizard App on the iPad too. The student can drag the letters to spell the words and get to play with fun graphics at end. You can even create your own custom lists that the app will call out for you and keep up with the score when they are done! I'm so glad you like the activities. Thank you for some other fun ideas too! I'll have to check them out. Hi, I came over from The Fairy and the Frog. These are super activities-what care and love you have put into this difficult part of your boys' education! This is really great ideas. I am a new teacher and am always looking for new ideas for spelling and writing.